Chapter 4 presented various ways to configure a spherical microphone array and discussed the advantages of each configuration. Once microphones are positioned in space in a desired configuration, e.g. on the surface of a rigid sphere , they can be connected to conditioning equipment, and the signal at each microphone can be recorded. In this chapter, the signals at the microphones are defined as the inputs to an array processor, producing a single processed output with some desired characteristics. One possible desired characteristic is to enhance signals from a sound source that is located in a specific direction and to attenuate signals from sources located in other directions, therefore forming a spatial, or directional filter. Such a filter is called a beamformer, because the beam it forms looks at a desired direction, and is probably the simplest form of array processing. 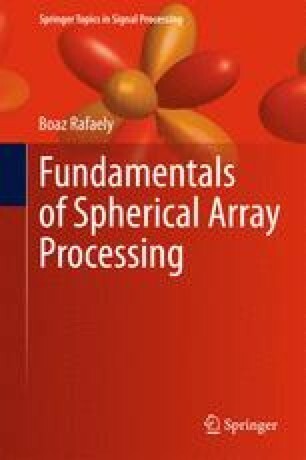 The first section of this chapter presents array equations, with array input, spatial filter, and array output formulated in the space domain. This is followed by the derivation of the same equations in the spherical harmonics domain, where the benefits of processing in this domain are emphasized. Two important measures of array performance, namely directivity index and white noise gain (WNG) , are presented in the following sections. These are derived both in the space and in the spherical harmonics domains. A simplified beamforming structure that produces axis-symmetric beam patterns and that decouples the shaping and the steering of a beam pattern is also introduced. The chapter continues with a presentation of two common beamformers, namely delay-and-sum and plane-wave decomposition . Finally, steering of non axis-symmetric beamformers is presented, and the chapter concludes with a beamforming example.